it is mainly used for comprehensive transmission test of SDH/PDH network and equipment and widely applied in the R&D, manufacture, acceptance inspection, performance monitoring, maintenance and measuring of networks and equipment. 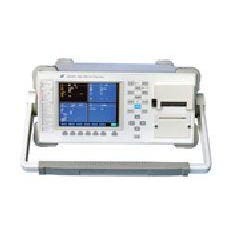 The instrument can insert and measure varieties of errors and alarms in PDH and SDH systems (including on-line and off-line test), perform performance analysis on various errors as well as modulate and test jitter signals at a max. test rate of 2488MHz (STM16). It also has many function-test capabilites, such as: automatic protection convert test, generation and analysis of pointer adjustment and frequency test. Alarm Detection: besides all the generated alarms, pattern synchronous loss and error are also added. The mapping and demapping conforms to ITU-T G.707(2000) Mapping Structure and relative rules in YD/T 966-1998. The structure is as shown in figure 1. You can set 5 sequences and every sequence can send max. 64,000 frames. The instrument accomplishes remote control through RS-232. The instrument can implent self-test functions. The instrument can print measurement results.